Kate Middleton makes Queen Elizabeth II herself her “example” of how to behave and work as a key member of the royal family. Kate wed Prince William in a glorious ceremony at London’s Westminster Abbey last year and has been adored by all ever since. 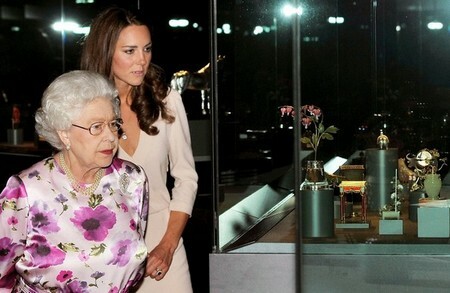 Since her marriage all reports indicate that Duchess Kate gets on smashingly well with the queen and is learning how to be in the royal family by observing her grandmother-in-law. As we reported a while ago on CDL, the Queen is said to be simply crazy about Kate – sadly the same can’t be said about the monarch’s feelings of disgust towards Pippa Middleton. Elizabeth is not the only member of the royal family Catherine enjoys spending time with – it was recently revealed she has also been meeting with her father-in-law Prince Charles to discuss cultural issues. Do you think that Kate can live up to Queen Elizabeth’s fine example? Let us know in the comments below. Did Kate Middleton Marry The Great-Grandson Of The Cook’s Daughter?